In the course of designing “nano-games” that have between 17 and 20 pieces for two sides and very small boards that fit on part of a postcard, I again had occasion to wonder if there is some kind of "sweet spot" or "magical number" of pieces and spaces for a boardgame (or any other kind, for that matter) where pieces occupy locations? I’ve seen several queries from novice designers asking if there’s an ideal board size, and my immediate reaction has been “it depends”. This question could be expanded to “is there a sweet spot in the number of pieces, compared with board size, in a game that involves maneuver/placement and geospatial location.” For games that are not about maneuver/placement and location, such as many modern boardgames and most card games, the question doesn’t apply. For RPGs and other games where you have an avatar, a single “piece,” as in many kinds of video games, the question also doesn’t apply, although we could ask if there is some kind of sweet spot for the number of characters in an adventuring party. But that question becomes more a matter of psychology than of game. Let’s look first at traditional non-commercial boardgames. Chess and checkers have 64 spaces, and (respectively) 32 (16 per side) and 24 (12 per side) pieces. Technically the checker board is 32 spaces, since you play on only one color. So the ratio of pieces to board is 1:2 in chess and 2:3 in checkers, and always goes down as pieces are captured. In Tic-Tac-Toe the ratio is ultimately 1:1. In the Roman Empire placement and maneuver game Nine Men’s Morris there are 24 intersections for the 18 pieces, a ratio of 3:4. (Tic-Tac-Toe is actually a much reduced variation of Nine Men’s Morris; both are draws when played perfectly.) Backgammon has 30 pieces and 24 locations, differing from these other games in allowing more than one piece per location. In such instances it isn’t surprising that the ratio is 5:4. Leaving the games of the West, in African Mancala, which is a boardgame even though it’s a board you can easily dig in the sand, there are many more pieces (stones) than there are board spaces. Oware, for example, has 12 spaces and 48 pieces (seeds). There are relatively few board spaces compared with other games I’ve mentioned. Shogi (Japanese chess) has 40 pieces and 81 squares for a ratio close to 1:2. Xiangqi (Chinese chess) has 32 pieces on a board of 90 intersections, for a ratio close to 1:3. In the Asian game Go, played on the intersections of a 19 x 19 board (361 spaces), we have a situation closer to Tic-Tac-Toe where you could leave all the captured pieces on the board and fill the board up. It may be no accident that Tic-Tac-Toe and Go are placement games rather than maneuver games. If you can’t move from one place to another then the only way to occupy a particular place is to fill it up with a piece. Intuitively, you might expect that fewer areas means the game is simpler to deal with, though the game may still have a great deal of gameplay depth. You might also ask how much are the limited numbers of pieces and spaces simply a reflection of manufacturing limitations in ancient and medieval times? Let’s look at some traditional commercial games for comparisons. Many traditional commercial games such as Monopoly, the Game of Life, Clue, and Careers have just one piece per player, a kind of avatar. Many of these games are not actually games of maneuver/placement and location; Monopoly has location but the players have no control over where they are so there’s no maneuver. Careers and possibly Game of Life have diverging paths but most of the time there is no choice about where your avatar goes. How about "classic" area-based wargames? Risk has 42 areas. Britannia has 37, plus 5 sea areas that can only be temporarily occupied and where combat cannot take place. Vinci has 45 (by quick count). Diplomacy has 56 land regions and 19 sea regions (75 total) for 34 pieces. History of the World and Axis and Allies have many more areas (and original Nova Games’ A&A had a lot). How about piece to area ratios? The average for Britannia depends on the era, but is roughly 55 pieces for the 37 areas, about 3:2. But as with several of these games, one area can hold more than one piece. The ratio in Vinci is something over one piece per area. In Risk it's a lot higher, at times, as massive armies build up. Diplomacy's ratio is much like that of chess, one piece for a little more than two areas (and no more than one piece per area). Unlike chess and checkers, the ratios in Diplomacy don’t change much over time because the overall game economy is slightly positive and then stabilizes. My motto in game design is "A designer knows he has achieved perfection not when there is nothing left to add, but when there is nothing left to take away" (Antoine de Saint-Exupery) or in another form, about Japanese gardening, "Your garden is not complete until there is nothing else that you can remove." Consequently, nowadays I look for the smallest number of pieces and smallest board that gives the experience I have in mind. For example, I have a couple prototypes that are vaguely Stratego-like. One dates back about 30 years, the other is quite recent but grew out of the first. I’ll describe the latter one below, and how I discovered I might need to reduce the number of pieces. The older one is a space battle game played on squares, and when I first designed it I stuck with something near the typical Stratego 40 pieces per side, though on a more roomy board. But when I resurrected it several years ago, when it was played mostly by video game students, I cut the number of pieces down to 19 and eliminated some of the special pieces - they became options that we rarely used. The ratio of pieces to board became 38:113 or about 1 to 3. This made for a much quicker game, as little as 15 minutes, that was just about as interesting and certainly as fun to play as the big version. But this cutting back is harder to do when you're trying to model a particular historical situation such as a battle or war. Going back to the “nano-games”, the postcard games, it’s quite difficult to provide an historical model with a very small number of pieces and very small board - you can really only focus on a few things. One reason why the traditional games mentioned above can have small numbers of pieces in relatively small boards is that many are abstract games rather than models of any reality. Even Diplomacy gives the appearance of World War I but virtually none of the reality. Risk is very far from reality. In the commercial game world we really didn’t have boardgames intended to be models of reality until Avalon Hill wargames came along in the late 1950s. (We can probably think of isolated examples before then.) Before then, only wargames played by the military tried to reflect some reality. What about the numbers of pieces and numbers of playing spaces in relation to human comfort and human capacities? This brings to mind the famous journal article “The Magical Number Seven, Plus or Minus Two: Some Limits on Our Capacity for Processing Information” http://en.wikipedia.org/wiki/The_Magical_Number_Seven,_Plus_or_Minus_Two. It discusses the number of things a human can keep in “working memory” at one time (barring memory tricks in specific instances). I don’t know of other research of this kind, but I’d be willing to predict that if average human capacity has changed it has gone down, rather than up, as we live in a world of more and more distractions and more and more multi-tasking leading to more and more routine mistakes and inability to focus. Human memory capacity more generally seems to continually fall, for lack of practice if nothing else. Where people in non-literate societies had to memorize any information they needed to retain, we went to writing things down, and now to recording them digitally. The joke used to be that old people had a disease called “CRS” (can’t remember “stuff” - or perhaps some other “s” word), but my observations of college and high school students is that they have CRS quite badly even as they usually refuse to write things down in class. Whatever research may show, I think it’s fair to say that 21st century game players by and large prefer fewer rather than more assets to keep track of, and less rather than more memorization. There are lots of exceptions, of course. Yet I’m put in mind of a very intelligent freshman game player who said she didn’t like wargames because there were too many decisions, too many things to keep track of. For her it became too much like work, no longer entertainment, though she was very capable of doing it. I myself quit playing chess at age 15 because it was too much like work, if you wanted to be any good. Perhaps one reason why Diplomacy has been so popular and durable is the small number of pieces for each player. Players start with 3 or (in one case) 4 pieces. Even a winning player probably averages no more than 10 pieces over the course of a game (18 is a certain win). And in the much more common draws (2-, 3-, or 4- way for a 7 player game) a player averages even less. When considering numbers of pieces we should also look at how many different kinds of pieces there are. Most of these games have just one kind of piece, the army in Risk or Vinci or the piece in Nine Men's Morris. Japanese chess has eight different types of pieces, Western chess six types. In between we have Diplomacy with two types of pieces, armies and fleets. I think the variety of pieces is sometimes almost as important as the number of pieces. Clearly variety appeals to those who play Western and Eastern versions of chess. One way to avoid the potential problems of using a variety of pieces is to avoid exceptions to the general rules. Going back to Stratego and my prototype, both games have lots of different pieces, but Stratego is almost entirely hierarchical, so that there’s no difference between a “2" and a “7" (using the old numbers where the 1 is the strongest piece) other than its strength. Only the engineers, scouts, bombs, spy, marshall, and flag are “unusual”, though many of them also participate in the hierarchy. And each of them offers just a single exception to the rules. There’s a hierarchy in my prototype as well, but submarines and aircraft make it considerably more complex, as some ships can sink the subs, subs can sink some ship types if the sub is the attacker, and the aircraft are all over the place and may combine in attack (two can move at once, remember). In other words, there are a lot more exceptions. I saw what we might call “resistance to too many choices” in relation to one of my playtest prototypes (World War II naval) vaguely related to Stratego. A casual player who loves Stratego, and played well, quickly buckled when playing my prototype. There were too many choices, too much freedom of movement. Stratego has lots of pieces, with a piece to board space ratio of 80:92. The number of movement choices is very much limited by the board and setup. In my prototype, though there were fewer pieces (25 per side for a total of 50), there were many more hexagons (13 by 12 for 156, piece to board ratio 1:3); the length of the “border” between the two players was much longer (12 or 13 hexes instead of 6 squares); and all pieces had a choice of moving two in a straight line as well as one space. (Aircraft can move in segments, and two can move in a turn, much more complex than scout movement in Stratego.) Even the winning conditions are more complicated in my game. In Stratego you only have to take the non-moving enemy flag. In my game you need to get a merchant ship to the other side of the map, or wipe out all the four opposing merchant ships, which can move of course. I’ve described this at some length because the heart of my inquiry has become, what do we do in designing games that makes them less like the classics, or more important, makes them less comfortable for players? It’s not just choice, or chess would not be as popular as it is. It’s a combination of things. With the above in mind, about a year ago I tried to figure out what an “ideal” introductory wargame would be like. One of the pretty obvious characteristics was “10 to 15 pieces per side”. And not moving all the pieces at once. (In fact, I realize I arrived at close to the same solution as Shenandoah’s Battle of the Bulge iPad game, that only pieces from two or three areas could move in one turn.) I also think the number of spaces must be limited, thus prohibiting the prospect of a board of hundreds of hexagons. In other words, keep it to the kinds of parameters we see in most of the games mentioned above. If the game can have both strategic and tactical elements it is a better introduction to the possibilities of typical wargames. I’ve ended up with a (two part geomorphic) area board for strategic movement, and a hex board for battles. There’s also an economy, which is what separates war games from battle games, though the economy does not dominate play. Unfortunately I haven’t been real excited by playtest results, perhaps because the tactical element (which I adapted from a space wargame prototype where it is quite popular) isn’t yet perfected for land battles. So I’ve set it aside for some months. As I said in the title, these are ruminations, I have no hard-and-fast answers to my queries. So rather than offer a solution, I’ll just end here. 2. Allow your fans to create their own cards and have them printed. 3. Imagine a card game where no two cards ever printed for the game are the same.
. . . the idea of letting a game's community take over the design of new cards will seem alien to many publishers, at least until some pioneer marches boldly out into the daylight, engages their community in a viral community design and purchase loop, and reaps the rewards of doing so. There is certainly some potential here for group designed games, but as a game designer and one who has taught game design. It reminds me of the weakness of what often amounts to random design. First, it reminded me of a game some of my students were making. To set up pieces at the start of the game they took the pieces in hand and dropped them on the center of the board, and took the randomly determined positions. This is a bad idea in most cases. You are the game designer, you're the one who should pick the optimal setups, not let it be determined randomly, unless you have decided that a random set up is a sufficient improvement in replayability to compensate for the randomness of it. Even then you should use controlled randomness not complete randomness. For example, if you want to randomly place villages on four quadrants of a map, make sure that about the same number are in each quadrant. But letting players design cards is a lot closer to complete randomness than to a game designer's best judgment. Has there been a situation where players are able to make up rules, even if they are vetted by the person in charge? Yes, role-playing games, especially old D&D. I recall advising referees more than 30 years ago to make players earn their advantages, not to let players manufacture them through additional rules, because the average player was going to take every advantage he or she could get, rather than consider what was good for the game. And is there a situation where official or semi-official rules made by variety of people proliferate to the detriment of the game? Yes Third Edition D&D, where the D20 license and Wizards' own need to produce new products resulted in vast numbers of character classes and skills and feats, and an escalation of foolishness in the rush to have every character be a "one-man army". If a referee didn't ban all that additional material he was doomed to a weak game, a sort of escalating arms race as players tried to find the additional material that most benefited them or that most advantaged their playing style. So let's recognize the other side of this revolution: players being players, if you let players help design the game it's likely to be a worse game than it was before, unless your primary objective is mere variety. Now it's certainly true that variety has more or less replaced gameplay depth as the desirable objective for contemporary game design, so this may work out for some people. But to me the game designer should control what's IMpossible in a game, though this is not the extreme kind of control a novelist has because a novelist controls exactly what is possible. The game designer sets the constraints and borders and walls, but lets players make things happen within those walls. If players are designing the cards or the rules - and of course cards are part of the rules - then the game designer loses much of his ability to define constraints. But just as there are ways of interactive storytelling where the listeners also tell the story, there may be ways for games to prosper without many constraints. Neither idea attracts me, I'm afraid. Constraints actually encourage creativity. I'd much rather have a professional writer convey the story to me, and I'd much rather have a professional game designer arrange the game for me. 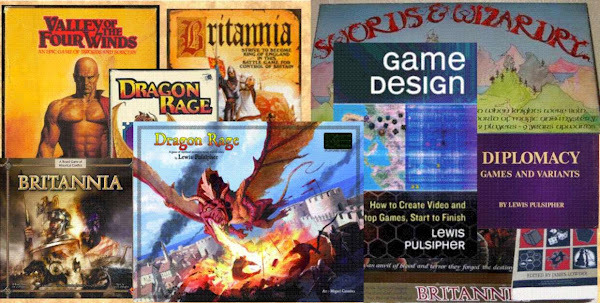 https://www.udemy.com/brief-free-introduction-to-game-design/ The "What You'll Discover" lecture from the course is on youtube at http://youtu.be/VjU8qPU0bTE. My book “Game Design: How to Create Video and Tabletop Games, Start to Finish" is available from mcfarlandpub.com or Amazon (paper or Kindle). (Books-a-Million has an eBook version at http://bit.ly/PQQqh3.) It's currently discounted on Amazon to less than $26 for the paperback. I've recently become quite interested in conversions between video games and tabletop games, especially wargames. I've been recruited by a large publisher to propose a book about wargame design that will first be about video games because that's where the big market is. On the other hand, there aren't many video games that are real wargames, at least in the definition I'm going to use, which requires games where reasoning is the primary requirement for winning the game, as opposed to the athleticism that's necessary in shooters and real-time strategy games. In fact, the book will probably be called “Strategic Wargame Design” because I need to limit the topic, so as to cover it reasonably in not much more than 100,000 words. Tactical games, whether video or tabletop, will be practically excluded. E.g. miniatures will get about 500 words in the entire book. The company actually creates a paper version of a game before they program it for the iPad (and some iPhones). Unfortunately, this means that the strengths of the computer for realistic wargames are ignored. For example, the computer is obviously stronger for fog of war than the tabletop. It is also stronger for command-and-control simulation than the tabletop, because the computer can keep track of details that would be onerous for tabletop players, and that ought to be hidden from the players. But there's always a dichotomy in wargames between what's actually realistic - war is a “big mess” - and what's fun to play as a game. Wargame players like to control what happens, they like to feel that they succeed or fail because of their own actions. Yet in war there's an awful lot of chance, as epitomized by the poem about a nation being lost for want of a nail in a horseshoe. So we can present the wargame player with a big mess that he tries to sort out, and that might be attractive to the improviser style of player. But for the planner style of player (more in the chess player mode) this is absolutely horrible. Perhaps that's one reason why I prefer strategic and grand strategic rather than tactical games (for the most part - I like old D&D), because as you go to a higher scale there's less messiness. Perhaps I ought to explain what I mean by "messy". In a real war, a commander barely knows what's going on within his immediate sight. He doesn't know how well his units are going to actually act under fire, he doesn't know where most of them really are, he doesn’t know where the enemy is for the most part, he doesn’t know how well the enemy units are going to react under fire, he doesn’t know how well his commanders are going to follow orders, he doesn't know how well his commanders are going to react to changed situations when they receive orders that are an hour old or a day old, and the situation is changed from what the overall commander understood - or he never understood it to begin with owing to all these limitations. It's one hell of a big mess, and I haven't even thrown in supply problems and problems of cooperation with air forces and navies and large-scale units that are not under the command of the particular general. Successful generals have to be very flexible, though paradoxically they need to plan a lot before the action. And to be successful they need "Yomi", the ability to read the minds and intentions of their opponents. Yet this is not what the minimax player is particularly interested in, and frequently is not what the planner is interested in. Shenandoah chose to be able to create a paper prototype that would be very closely emulated on the computer, despite the limitations this imposed on the computer's ability to reflect the reality of the big mess. In Battle of the Bulge there is no fog of war, there is no calculation of movement of orders and successful or unsuccessful understanding of orders, of orders getting lost, orders being ignored, subordinates being insufficiently competent (or quite brilliant), and so forth that would emulate the reasons why command and control problems occur. Instead, they try to emulate the way a commander may not be able to control everything by using “activations,” but these are activations that the player chooses rather than activations determined by pulling random chits out of cups or being dealt random cards. So in each day of the Battle of the Bulge, the player chooses in his turn one area that has not yet been activated, then he can move all of the units in that area wherever they choose to go. Battles caused by the movement are then resolved. A random interval of time passes and it's the opponent's turn to choose one area and move. No area can be selected more than once in a day. The command and control difficulties really come into it because of the passage of time after each move. The day may end before all the player's units have been able to act. The game includes supply lines. It also recognizes that the Germans literally ran out of gas and reflects that at the appropriate time, by choosing a German unit that cannot move that day, and it recognizes that the weather changed and made things very difficult for the Germans owing to Allied air superiority. The other advantage of this limited activation design is that there is relatively little downtime between play by one player and play by the other player. It's a back-and-forth choosing of one area at a time and moving a few division- or occasionally regiment-sized units. This also simplifies what the computer needs to calculate, such that the developers have been able to get the Battle of the Bulge to work on iPhones down to the 3GS, with a few minor changes because the small screen. The program also works on all iPads. It's also possible to use the computing power in conjunction with iOS to provide a computer opponent or "AI" for those who aren't playing against another human. The AI doesn't need to deal with much change because the opponent has only been able to activate one area since the last turn of the computer opponent. This also makes it easy for play through the Internet. A player can take his turn and send it to the Apple Game Center whose use comes free with iOS, I'm told. The turn goes to the opponent's computer where it executes on his iPad, and he can then take his own turn and send it back to the first player. iPad/iPhone owners are willing to pay much more for apps than Android owners, with less piracy as well. Shenandoah is able to sell their game for $10, more than typical mobile apps but much less than a typical tabletop or well-known video game. I was able to talk at some length with Shenandoah producer Jeff Dougherty at WBC. They come from the boardgame side and their primary market is boardgame players, although buyers tend to be somewhat younger than the wargamers we see at WBC, and they get more people from the video side than one might expect. Jeff explained a technical reason why they don't use fog of war. It turns out that the "model view control" method of programming (http://en.wikipedia.org/wiki/Model%E2%80%93view%E2%80%93controller ) means that it's a lot harder to program fog of war that I thought. As related to wargames, in this method of programming the "model" is all the information the computer needs to be able to act, the "viewer" shows the particular player what they can see, and “control” is what the player does to manipulate the game. To have a computer opponent you effectively must have a separate viewer for the computer opponent, because otherwise it uses the model itself, and then has access to information that a player shouldn't have. In other words, if you use fog of war the programming becomes more complicated. Some readers might be interested in the following. The first draft of this post was "written" as I was driving from WBC to my home in southern North Carolina. I dictated it to a Sony digital voice recorder that has been recommended for use with my Dragon Naturally Speaking voice recognition program. When I got home I transferred the file to my desktop, ran it through the transcription program, and then edited it and added to it as necessary. Why would I do this? Well, when you become a senior citizen your efficiency in simple tasks like typing begins to deteriorate. In addition, I have arthritis in my fingers, which is a big part of the problem. Though I used to be a demon typist, I would much rather talk to the computer, even to the proxy of the voice recorder, than type. Voice recognition is still far from perfect, even on a quad core I7 processor with 9 gigs of RAM, but it's not too bad. And it is ever so much more relaxing than typing. Last of all, of course, I can't be typing while I'm driving. But when the traffic on the Interstates is light as it was on part of the trip, I can dictate while I drive. This dictation takes some practice, but I've used Dragon NaturallySpeaking quite a bit. It's not like writing at a computer, however, as I don't see what I'm saying, whereas when I use Dragon Naturally Speaking at a computer it recognizes what I say and shows it on the screen almost immediately. When I'm talking to the voice recorder I have nothing to show me what I've said in the past. But it's still a lot better than nothing.